Policing is actually a competitive program to get into and as such there are often far more applicants than there are places. So if you are going to be able to get a place you have to ensure that your application is going to be able to display your abilities in a way that will make you stand out from those competitors. This is going to take a huge amount of work on your part but without that work, you may miss out on the place that you are targeting. With many of the other applicants being similarly qualified to you, it is important that you spend a lot of time on your personal statement for criminology and psychology. Your police personal statement will often be your opportunity to stand out and if written well it will be the deciding point in any decisions over your acceptance. Using an example of personal statement writing for your policing application is a very good way to understand what is expected of you. You can use a good example to provide you with guidance as to what areas you need to cover and also the style of writing that will be required of you. However, you must never simply copy any example that you find, it won’t help you to get the desired place. Your police personal statement, as well as a personal statement for criminology and psychology, must be about you and carefully tailored to the program that you will apply to. Always review the precise requirements of the chosen program and tailor your statement to reflect those expectations. Cover everything that the program will want to know about you: why you want to study policing? What you have already done in this area? What makes you qualified to follow these studies? What career goals do you have? Why are you applying to this program rather than another? Always try to open with an effective hook: your opening line must be capable of igniting the reader’s interest and making them want to read on. Make your statement flow like a story about yourself rather than it being a list like your resume. Avoid the use of any clichés within your writing. Do not reuse any information that is elsewhere in your application. Only use everyday language that anyone can understand: avoid the use of fancy words, acronyms, and slang. Avoid the use of any humor within your writing. Proofread very carefully to eliminate any possibility of errors. Ours is a highly specialized service that can provide you with needed writing assistance that you need with your personal statement writing. We will assign you our best admission essay writer online and you will always work with an expert in your field of application that holds a postgraduate degree. Our experts fully understand the essential requirements of the program that you are applying to so they can help you with producing work that is totally unique and error free. 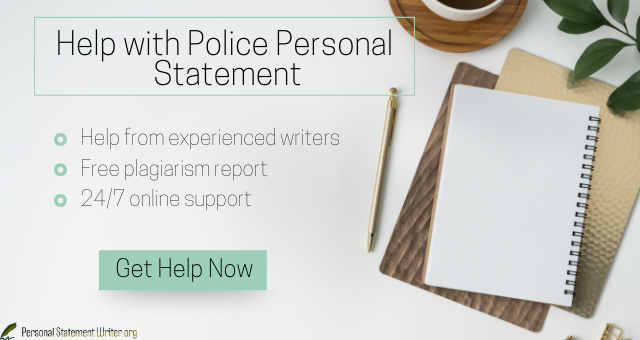 Submit a policing personal statement written by an expert and will get you noticed for all the right reasons!